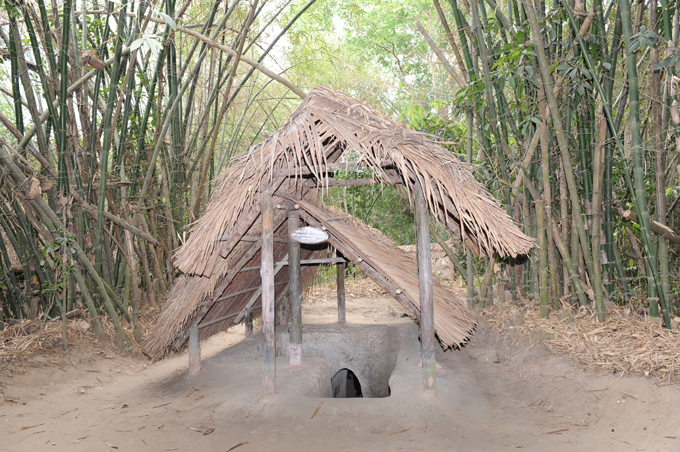 To Ben Duoc Tunnels, tourists will visit the tunnel system, the cellars that the leaders of the District Committee and the Military Zone of Saigon - Cho Lon – Where Gia Dinh lived, fought during the war. 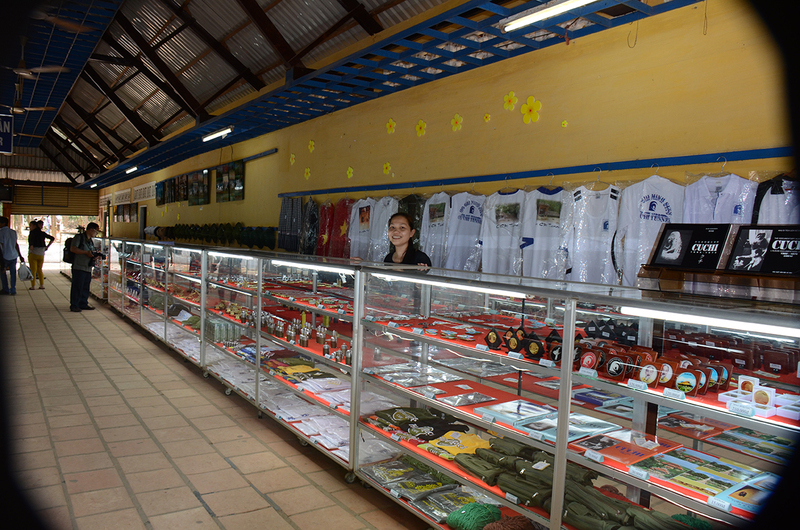 In front of the ticket gate, at the edge of the forest, the tourists will visit the exhibition space of bombs, artilleries of the US military that were used .on the Cu Chi battlefield and the weapons of Cu Chi guerrillas to fight against the US Army and the army of the Republic of Vietnam. Through the ticket gate, guides will take the visitors to go into the forest in the melodious music of the war resistant songs, mixed with the singing of chirping birds to the area of the forest to see the hall of documentary film and hear the female interpreters in black dress shirts, beard sandals, camouflage hats and bandannas to introduce about the development history of the strategic system of Cu Chi tunnels. Then, the tourists will visit the actual tunnel works that are deep in the underground as: the cellars that the leaders of the District Committee and the Military Zone of Saigon - Cho Lon – Where Gia Dinh has worked and lived, the assembly Cellar, the cellar for surgery, the A cellar that prevents the collapse caused by bomb, firecrackers near misses, the cellar for food and weapons, the secret caps, the vents, the fighting drives, the wells, Hoang Cam kitchens, the war factories, the house for military equipment, the house for cutting the beard sandals, the gallery of homemade weapons ... 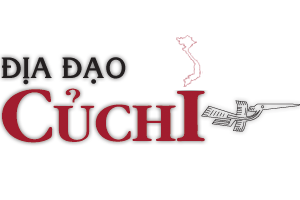 In particular, the visitors will witness a creative invention to hide smoke of the Hoang Cam kitchen and enjoy the foods of former guerrillas that have now become special dishes: squeezed rice, cassava with bean salt. Away from the tunnels with heroic feats, visitors will visit the area that sells war souvenirs with gifts made from shells of bullets such as oil lamps, lighters, ballpoint pens, strap, or beard sandals made from old tires and lacquer items, art luxury goods, goods that were made off rattan, bamboo, leaves that are special products of the traditional villages in Cu Chi. Through the forest, the tourists will come to Ben Duoc Memorial Temple for martyrs. In here, visitors will have a deposition minute of silence in the soul and burn incense to commemorate the compatriots, the heroic martyrs who heroically fought, sacrificed for the cause of the national cause of liberation, construction and defend of the Socialist Republic of Vietnam. At the same time, they will admire the largest ceramic mosaic of Vietnam .on the three walls surrounding the main temple and stand .on the 9 floors tower to view the peaceful scenery of the old "iron triangle" that winds smoothly beside the smooth drifting Saigon River. Leaving Ben Duoc Memorial Temple for Martyrs, visitors can use the tram to visit the mock-up that performs the defeat of the Cedar Falls Operation of the US military into the "Iron Triangle" area in 1967. 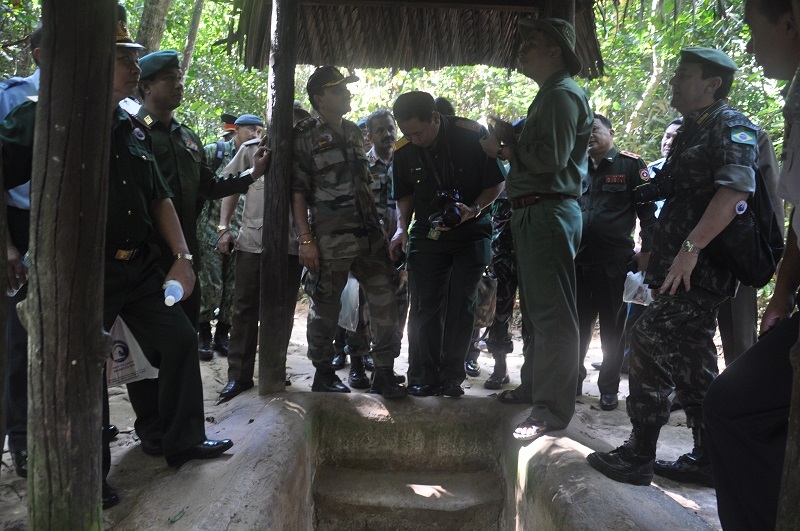 The simulation region of liberated Cu Chi is with the peaceful countryside scenery, the shady paths of green bamboos, the houses made from leaves of the trees that are now .only memories, the rural market with rustic dishes, or witness the crumbling ruins of Cu Chi homeland and the magic battles of the guerrillas inside the tunnels. Visiting the landscape Lake that is the simulation of the East Sea, the forest of precious woods and the 3 miniature models that are the typical sites of the three zones including: .one Pillar Pagoda (Hanoi), Ngo Mon (Southern Gate) (Hue), Ben Nha Rong Wharf (Ho Chi Minh City), or indulging yourselves in the blue water of the swimming pool with the separate architecture that is very close to the nature. An opportunity that should not to be missed when tourists come to visit Ben Duoc Tunnels is to test your thrills, your shooting talent at the Military sport shooting field, or split into two teams to play a pretending fight of paint shooting. 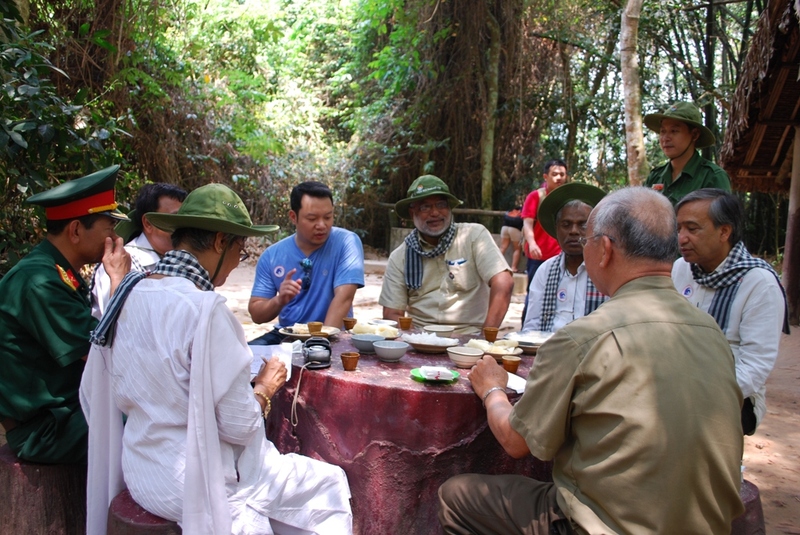 Ending the tour, visitors will stop at Ben Duoc Restaurant that is located .on the bank of the Saigon River to breathe the fresh breezes, watch the fields .on the other side of the river with the fluttering wings of the flying white storks, enjoy rustic dishes of the countryside of the South East region and the special dishes of Cu Chi. It is certainly that the tour will remain in the visitors an unforgettable experience, a very interesting experience, which is the admiration of the intelligence, the creativity, the fighting spirit and the stamina of the military and the people of Cu Chi in the construction and development of the system of "fighting Tunnels" that is famous all over the world.